The Sun newspaper said: "Funny, poignant and honest, this is a cracker of a debut." 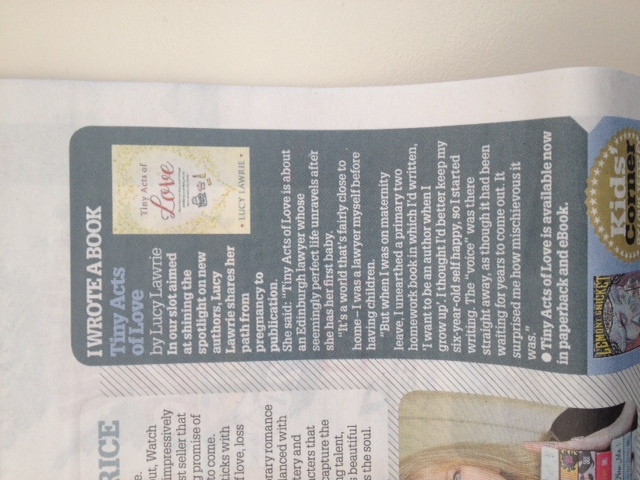 Tiny Acts of Love also featured in the Sun on Sunday's Fabulist. OK! magazine said: "A beautiful portrayal of the tribulations of becoming a new mum, it's a fantastic debut by Lucy Lawrie." Closer magazine said: "With tear-provoking moments and chapters that will make you laugh out loud, this page turner is impossible to put down." 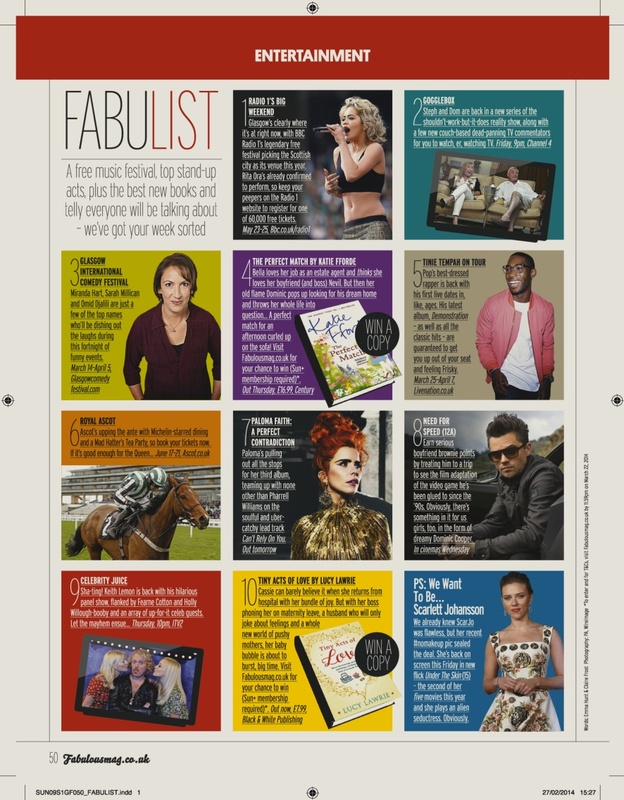 The Lady magazine described it as "a vivid read that's bound to touch a chord." Liz Loves Books said: "Lucy Lawrie takes us on a journey of emotional depth, ingenious observations and absolute understanding of post natal perceptions and sensitivities. If you have ever been a new Parent every moment of this novel will resonate with you… Really cannot recommend this highly enough." Deal Sharing Aunt said: "I felt for Cassie and have seen how a new baby can keep you up all night, and this is an honest look about what really goes on. It is done in a way that other moms can relate and relax with a good laugh." This Chick Reads described it as "an interesting story, not just about motherhood and parenting, but also about believing in yourself and fighting your worse fears." Laura's Little Book Blog described it as "A really heartwarming, down-to-earth, real read which I thoroughly recommend everyone should read." A Spoonful of Happy Endings said: "‘Tiny Acts of Love’ is a realistic, funny and moving novel that shows the rawness of marriage and parenthood and focuses on those moments we all have of doubting what things could have been like if we had made different decisions." Little Miss Literature described it as "A warm, fuzzy debut which kept me hooked and smiling." Curling Up With A Good Book said: "From the very first page I was drawn to this story! I would for sure recommend this book!" M's Bookshelf said: "Tiny Acts of Love is a very moving, very real "new mommy" story I would highly recommend. It really is beautiful and very touching." Cometbabesbooks described it as "A brilliant debut from Lucy Lawrie, excellently written from start to finish." Compelling Reads said: "I can’t recommend this beautiful, funny and true elegy to the painful and joyful journey that is parenthood enough and I am eager to read Lucy’s next novel." Me, My Books and I said: "This was a fantastic debut novel, touching and amusing with a wonderfully real feel to it." The Student Newspaper said: "With emotional depth, absolute understanding of the postnatal struggle, and an impeccible exploration into human sensitivities, this novel will resonate beyond its setting of motherhood, to all people." Room for Reading said: "It's a great story to curl up with - funny, touching and romantic, and in some parts quite sad and poignant. It really has it all!" Cosmochicklitan said: "Tiny Acts of Love is superbly written and takes the reader on a journey of the ups and downs of new motherhood and general obstacles life throws at you." onmybookshelf - I Heart Chick Lit said: "It was a very, very emotional read, full of understanding and sensitivity… Brutally honest about being a new parent and how it can affect the relationship between the woman and the man." The Inverness Courier said: 'First-time writer Lucy Lawrie constantly sidesteps the predictable while creating a very real world peopled with flesh and blood characters.' This review also appeared in What's On North, the Northern Scot, Lochaber News, Highland News, the Ross-shire Journal, the Strathspey and Badenoch Herald, and the Forres Gazette.